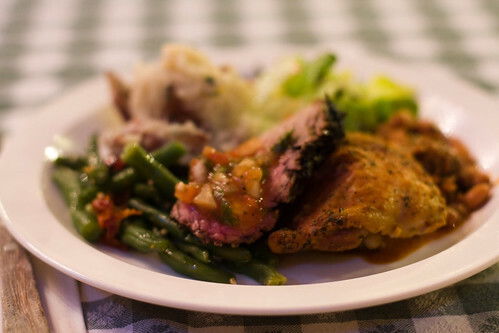 This weekend I experienced the treat that is the Circle Bar B Ranch's Dinner Theatre. A $45 ticket gets you a generous Santa Maria style tri-tip and chicken bbq dinner, then a performance of their latest production, The Drunkard. And you thought drunks were confined to lower State Street on the weekend? Oh hell no. This Victorian melodrama is the story of a young couple in love, financial woes, villagers with evil and creepy thoughts of resentment and revenge, and provides a lesson in what happens when "the demon drink" can get the better of the situation. Thankfully, the show has heroes as well. Sean Jackson as farmer William Dowton was my favorite character. William appears simple, but is quick to understand situations and act on them, under the guise of innocent observation. His expressions throughout the play, his dance, his accent, and his character's empathy had the audience cheering, but mostly had them in stitches of laughter. I don't know if this was intentional, but I like how the sack of nuts he carried around in the play grew progressively bigger as the years pass. Grant McKee as Squire Cribbs was another standout, as the quintessential (and campy) villian with maniacal laughter and a whirling cape. Again, much laughter, and also much booing and hissing as we are encouraged to particpate by way of cue cards. Both Jackon and McGee, btw, are Santa Barbara actors! That was another cool thing about the CBB's production - lots of Santa Barbarans were in it. Too many SB connections to list out in this blog entry. The item practically worth the ticket price alone was the Olio. Not the oil! An Olio apparently is a musical intermission between a melodrama. The cast and production crew donned multiple costumes and put on a Smothers Brothers-esque variety show, with vignettes from the Trillage People, Pelvis, and many more. Pelvis, with a cameo by producer David Couch, made the performance even better with a true wardrobe malfunction. Tee hee! Needless to say, the Olio had great costumes (Victorian Vogue, I believe) and lots of fun singing. The Drunkard runs for three more weekends, through 15 May. The performances are Friday and Saturday evenings, and Sunday afternoon. It is appropriate for all ages, great for groups, and an absolute hoot. On top of the show, there are other perks to going. First, the drive up 101 and Refugio is gorgeous right now. I caught the golden hour driving up, with fields of grass and mustard, then passing through orchards of citrus and avocado and stands of Coast Live Oaks. Second, the tri tip dinner is pretty good! Grilled tri-tip or chicken, and all the fixings of salsa, grilled bread, green beans with sundried tomato, mashed potatoes, green salad, chili beans and chocolate cake for dessert. Iced water, lemonade and coffee is also included in the price. The food is served buffet style and everyone sits at long tables together to socialize. But yeah, The Drunkard is literally at Circle Bar B, too, because they have a full bar for cocktails while you nosh the tri-tip dinner. Whiskey? Brandy? Gin!? The Drunkard or "Down with Demon Drink"
very nice write-up lemonjelly. Im going to have to check that out. Saw it tonight. Great fun and a great dinner! BTW the Olio was a spoof of Rowan and Martin's Laugh In. Ah ha! Thanks for the info, Hylla. Good to know their names weren't just potty humor. The costumes were not from Victorian Vogue, actually. They were from a wonderful costume shop with fair prices and I have used them for many shows in town, including several operas at Opera Santa Barbara. It's a treck out there, but certainly worth the drive. THE THEATRE COMPANY OF UPLAND, 1400 N. Benson in Upland, near San Bernadino. Go there if you ever need great costumes. If you want to see some more WONDERFUL costumes from the 1920's era, and some great acting, and a BEAUTIFUL set, come see POSTMORTEM, running now through September 9 at the Circle Bar B. I think there are some tickets left for Friday of this week even!.